HoodMart.com is making waves in the commercial restaurant hoods market with their 'Free Shipping' option. In these budget tight times those starting a restaurant welcome the Savings of $250, $400, $625 and more. While some companies charge extra for items such as Lights, Air Gap, and Hanging Brackets HoodMart® includes these with all their hood packages. There's an old saying that the devil is in the details. This is coming true in the Commercial Restaurant Hoods market these days. When some dealers advertise free shipping, but then go on to add some fine print, that changes their Free Shipping to your Fee Shipping. Restaurant owners and contractors Beware! It can be very appealing when searching the Internet for the best price on commercial kitchen hoods and you come across a company that announces 'Free Shipping on all hood packages'. Your first reaction is great, that's for me and you may be eager to jump at one of those deals. But will it really be free shipping? Is the commercial hood package you are buying complete? Have the hidden costs of packaging and crating fees somehow shown up on your invoice? Is that Free Shipping? 1. Hidden Costs - If the restaurant hood package offers 'Free Freight' make sure there are no hidden costs of packaging and crating before you click the complete order button and finalize the sale. 2. Know What’s Included – If purchasing a Type 1 Exhaust Hood be sure the items that are required by code are included. Do not be mislead with a low advertised price but then need to purchase additional items to complete your hood. "While some companies charge extra for items such as Lights, Air Gap, and Hanging Brackets HoodMart® includes these with all their hood packages." said Pat Ranch HoodMart's customer service manager. 3. Factory Direct – Make sure you know the company you are buying from. Is it the Factory or a middleman? This can save you headaches in the long run. What if you need a custom size? How about technical support, is it offered after you purchase? HoodMart® is Your One Stop Restaurant Exhaust Hood Shop and offers customer support from start to finish. HoodMart is always a click or toll free call away 1-800-715-1014 to answer your commercial kitchen hood questions. HoodMart.com offers commercial kitchen hood systems in a variety of sizes from 4 feet to 30 feet. Restaurant and Food Service Safety is a Priority with HoodMart's wet chemical Pre-Piped Fire Suppression Systems. NOTE: All HoodMart's restaurant exhaust hood systems are ETL listed to the UL710 Standard, built to the NFPA 96 Standards and NSF Listed. 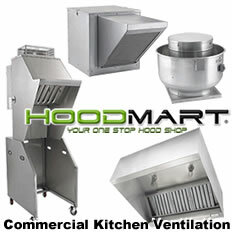 For more information about HoodMart's commercial kitchen ventilation equipment and services, we welcome you to call or visit us at HoodMart.com.